little momma and company: my obnoxious carry on. Coming home from Arizona, I was graced with what seemed similar to a third child. Dubbed "the white monster" by my Mother-- I had finally received the "pure white" king-size quilt that I had asked for over the phone. It was lovingly spring rolled tight, and tied with leftover fabric scraps. My sister whipped me up a make shift bag from an old pillow case with extra long straps cut from some leftover thrift store yardage. When I say extra long, they were extra long! But, I was determined to get aboard that flight with my quilt in hand, and make it home without a speck of dirt among it's bright whiteness. My sister and her husband were miraculously departing from the same gate as I was and were able to help out a lot. It was so nice! While waddling to and fro, we kept hearing a slight ripping noise-- and would stop, only to check everything and shrug it off as our imaginations. Until, one whole side of the bag decided to give up the ghost and rip itself completely from it's matching counterpart. What a beast, that old white quilt. Causing a woman with small children in a busy airport such trouble! Stuck with a big white quilt and a homemade monstrosity unable to actually function as a bag anymore, we went to a ticket agent and asked for a plastic bag. What we got was even more obnoxious than the original-- at probably six feet in length, and wide enough for a small family of four to fit inside, I dumped my belongings in it and prayed that I would not run into anyone that I knew as I hoisted my gigantic clear, plastic Santa sack upon my back and waddled (with boys in tow) to our destination flight. But, it made it home. And, without a smidgen of dirt on it. I love the pattern and the way it catches the light. It makes my room so comfy. It's perfection brings all of my collections together. I was even inspired to set out some of my antique french school books. Thanks mom! I love it! I can just picture it. Did no one stop to help? Sad. Your room is very fresh and simple looking. Beautiful. Ohh, I love it! Do you have built-ins in your room? It looks fantastic! 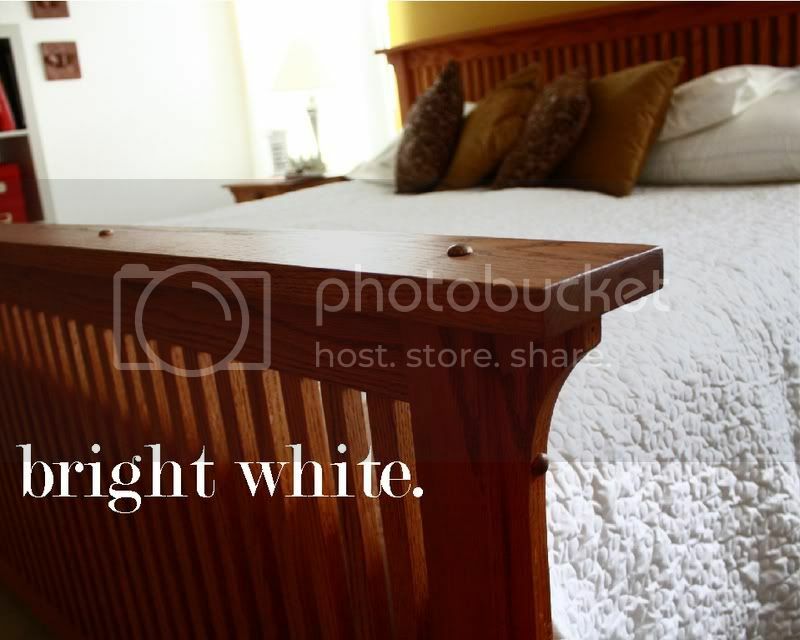 We're remodeling a home in the spring, and I've been eye-ing bright white bedding for my room. I think you've just sealed the deal for me! Oooh, I love it, and would have loved to seen you hauling it around the airport - too funny! Now keeping it white will be the trick! Did your mom make that quilt? It's truly awesome! I'm so jealous! 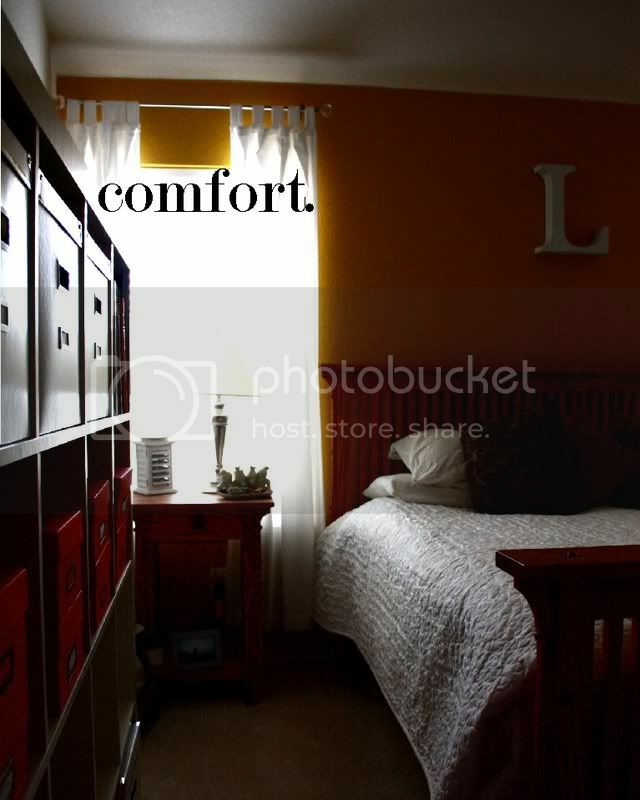 :) Your bedroom looks fantastic- like a retreat for a Mommy. Shanna, actually-- she made it! It was a "special order!" we have a white comforter too-i love crisp white! its just classic. It's beautiful and would stay white for about .01 seconds at my house. How lucky are you to be able to have white?! LOVE LOVE LOVE the "L" on the wall. Where did you find it? I've been looking for something similar everywhere! Glad you decided to not go totally private. I enjoy reading. I was wondering...how did you figure out about the "gross" site visiting your blog? I'd love to know so I can check up on who's looking at my blog. I'm not really skilled at the tech stuff. BTW...beautiful quilt. 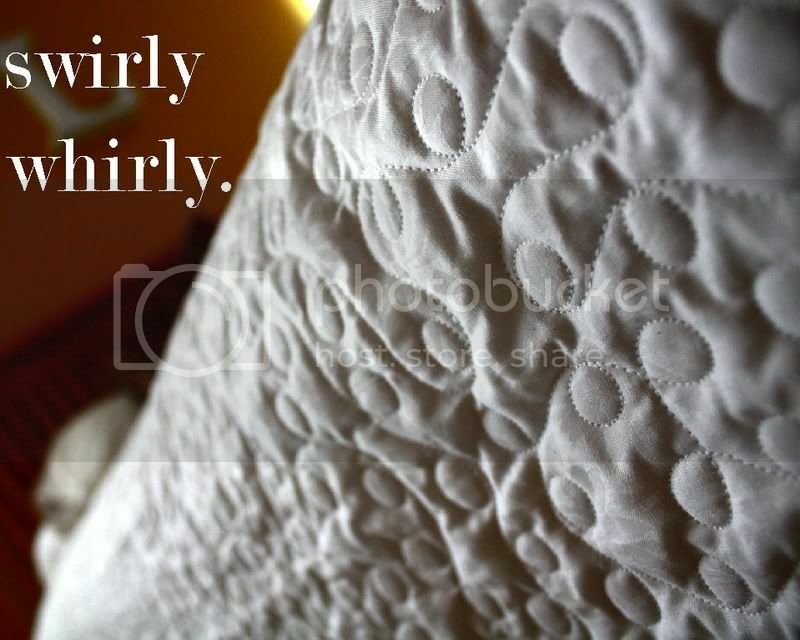 Love the new blog, love the quilt, and love your new camera. Can I have it? OH SO PRETTY! I love that big L on your wall! Chello...lol That quilt is Beautimus!! Welcome back! Missed your daily posts. I'm in love with white. To my husbands demise, I just about painted almost everything in house white over the holidays. Can't go wrong with white, I say! 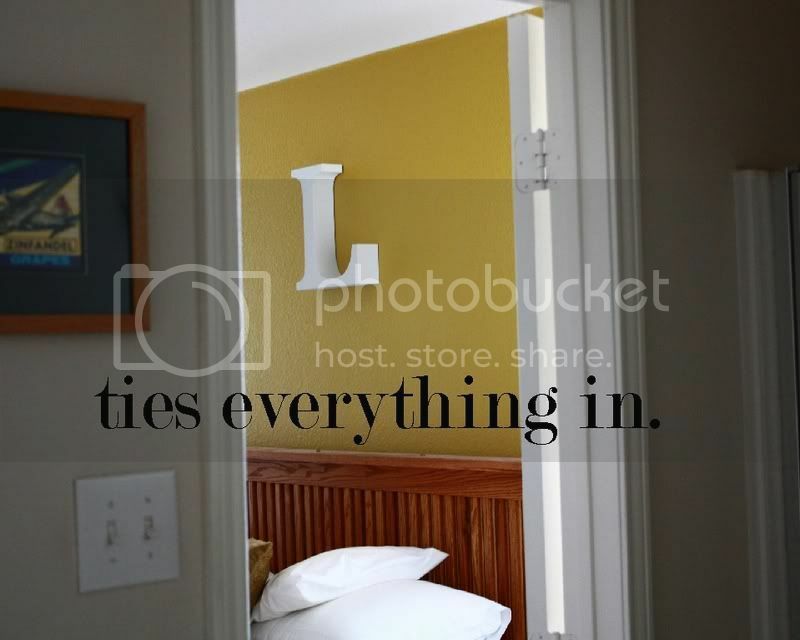 (Love that letter "L" above your bed, where did you get it?) P.S. Great shots in your previous post too. Got to get me one of those fancy cameras! My dad made it! Isn't it awesome?! I was in SLC two years ago and saw one similar in a botique shop for well over $85. I asked the owner of the shop if I could take a photo and she said "okay?!" and I did and sent it to my dad for a quick reproduction! It's actually made out of scrap metal used to print newspapers. I painted it white last year when I painted my bedroom wall that French Quarter Gold. I want that lovely piece of furniture to the left of your bed in the photos! With the baskets and all! Is there anything, ANYTHING at all, ugly in your house? Please tell me you have something that isn't so wonderful. I could move in with you. Totally. I love the frenchy stuff!! And the quilt, of course, is so blissful! Looks fabulous indeed! Can't imagine the sight of y'all in the airport hauling that around. EM! How are you girly! HOw I have missed you and your blog...*gasp* you are going private...! NO! I love your blog EM! Please take me along...*pouting* I just got back my life...yes I am cancer free! Yippeeeee! 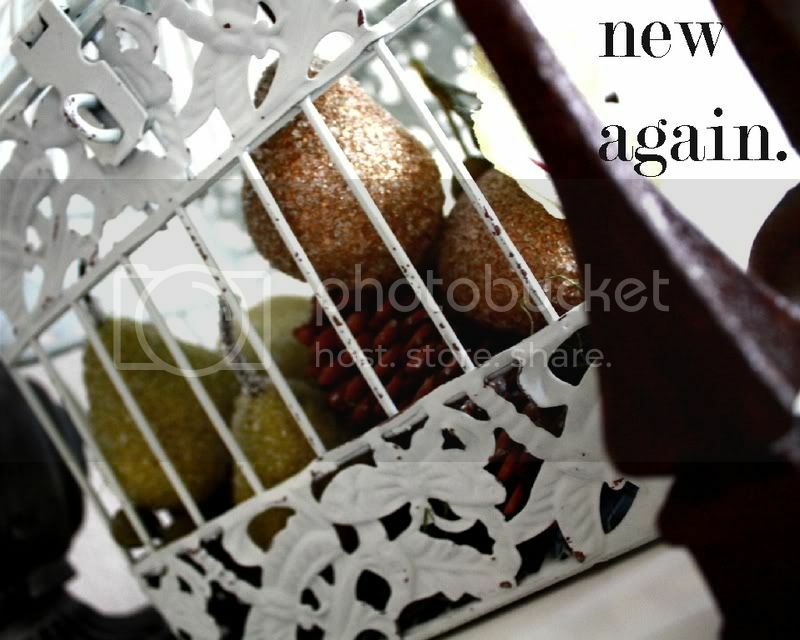 See my life begins anew! I see if you do go private you want us to email. Will you do that before you go private I will mail you a fab cupcake friend! Bribbery might get me everywhere! Sorry you have had some issues not NOT fun and really gross! Well girly Happy New Year to you and yours! I have missed you and love being back! It's beautiful!! What a great piece!! oh that story Emily!!! I could not keep that at my house...my doggie & 2 kiddos + white do not go together. Your mom did great work. I love the new design!! I am glad you are still blogging. My GOODNESS Emily...When I heard the story about the airport I about died...All I could think of was that pure white on white fabric and what seemed like miles of binding I had just hand sewed on it!! I am SO thankful that you had help from Amanda and were able to get it home spotless! I am so glad it never even touched the airport floor! It looks wonderful on your bed in your room...very very nice. Now don't let the boys in there!! And after it is washed and dried, it is going to look even better!! Just be sure to not over-dry it in the dryer and keep fluffing it up as it does dry to keep it from balling up into a knot. I'm so glad you love it and happy I was able to make it for you! I am sorry it did take me an entire year though! Hey Emily... the L looks good painted. For those wanting to know, it's a hollow wooden shell covered with old Prescott Courier newspaper printing plates from 1983 I think. And... the white quilt mom made looks good on the bed I made right before your wedding. Hummm... your whole house seems to have been furnished and decorated by the members of your family. How cool is that? You're back! Your room is beautiful - I could go on about the paint colors, the furnishings, but I think everyone else already did. Love it. Love the quilt. The best furnishings are the ones with stories behind them. At least they didn't make you buy a seat for it. The quilt looks beautiful, it was definatly worth the hassle... coming from someone that didn't have to hassle with it. So glad you're back. Missed your blog and the music. Love the quilt. That should've warranted a trip to Ross for a cheap suitcase. Totally worth the $15 for that headache! Looks great though, totally worth it! I LOVE white. I have written entire posts about my love of white. Your quilt is lovely.